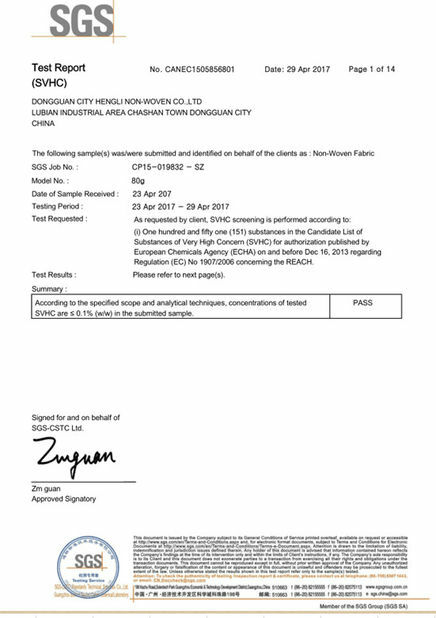 Dongguan Hengli Nonwoven Fabric Co., Ltd. is located in Lubian industry Zone, Chashan Town, Dongguan City, Guangdong Province, China. Our company was founded in 1998, occupying an area of 9,500 square meters with 5, 000 square meters of workshops. Now, we have owned three reifenhauser spunboned nonwoven fabric line, the lamination line, the printing line, TNT table cloth fold line, perforated rolls line, high speed cutting line, the Ultrasonic line and so on. Our intensive processing expanded to printing, welding, Perforator, Ultrasonic... which widely used in many fields. Weclome your patronage! Colors: Full Range Available - As per the PANTONE® card to cater to the specific requirements of our customers. Home textile: Mattress cover, pillow covers, bed sheets, etc. Hygiene & Medical: surgical growns, Caps, Slippers, etc. Packing: all kinds of shopping bags, rice bags, tea & coffee bags, etc. Agriculture: Crop cover, banana bags, weed control fabrics, etc. Lining & Attachments: Spring bags, Sofa & bed Lining, garments interlinings and so on. In 1998, Hengli is officially founded. At its early days, there is only one Nonvoven fabric Machine and several workers. However, our hardworking Hengli staffs are afraid of no hardship and working on the production forefront day and night, all of these contribute to Hengli survive in fierce competition. In 2003, Hengli moved its plant form to a bigger floor area. And in the same year, Hengli successfully Established the cooperation with Ikea and Royal Furniture. In 2008, Hengli invested the new Laminated machine which is the 1st 1.6m width laminated machine in whole Guangdong nonwoven industy. This new machine helped Hengli to spend the most hard time during the Financial Crisis. In 2013, Our new 2.4m machine had been set up. In 2014, Two printing line had been estiblished. With both flexo-printing line and off-set printing line, we can meet all customers requests. In 2016, Due to the environment protection in whole world, more and more disposible items demands in many territories. Thus, Hengli took this chance to invested the Table cloth cutting and folding machine, the perfomated machine for table cloth and bed sheet. All these investments brings Hengli for its new era. 1. “ Quality is our culture.” We had 7 professional production lines for nonwoven farbic, laminated fabric, printing fabric, tabel cloth. The strict QC team, the advanced test equipments provide customer the good Quality products. 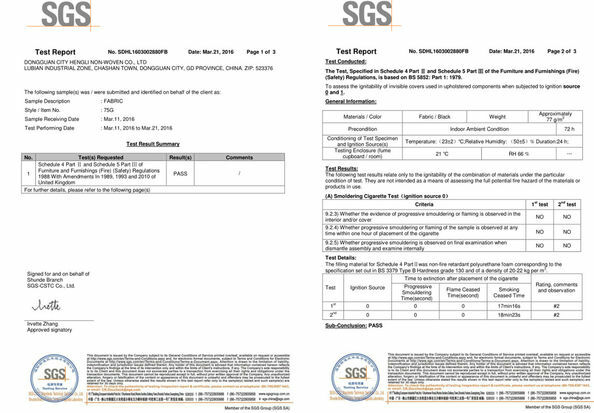 All our fabric had SGS report. 4. “Quality is the soul of an enterprise.” We had the honor to serve IKEA, Royal funiture, Samsonite, Delsey and so on.